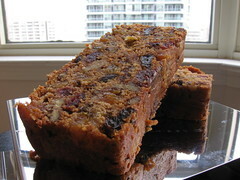 Applesauce Fruitcake - Do You Know The Muffin Man? Notes: I was hoping this would be the fruitcake that I would be baking and selling this year, but it was a bit of a letdown. First, the recipe is supposed to be baked in 12 mini-loaf pans, but I tried it in two 8×4" pans. They turned out fine, but a bit small. With that size pan, I think scaling the recipe by 125% would be alright, but that's a hassle to do. There isn't a lot of alcohol, merely 1 cup brandy, but the use of two kinds of nuts is welcome. Applesauce contributes some moistness, but I didn't think it was that fantastic, even after aging for about 5 days.